After death, a substance in the blood hardens, and that which does not crystallize is called a blood stone. At the workshop, these bloodstones are embedded in weapons to fortify them. 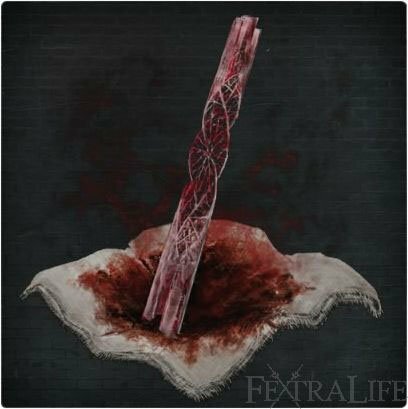 Blood Stone Shard is an upgrade Item in Bloodborne. Used to Fortify weapons up to +3. You will need 3 to get to +1, 5 to +2, and 8 to +3 for a total of 16. Possible drop from Wolf Beasts. Once you have reached the shortcut in Old Yharnam you can farm shards from the wolves in that area, which is nice to upgrade all your weapons. The Wolf Beast just before the Old Yharnam lantern appears to have a near 100% drop rate, with the chance of getting two at a time, and will also drop Beast Blood Pellets rarely. Possible drop from Large Huntsmen on the walkway above sewers. Possible reward for defeating Chalice Dungeon bosses in depth 1 chalices. Possible drop from Hunting Dogs in Hemwick Charnel Lane. 1x Central Yharnam, atop a flight of stairs to the right of the first Mob Bonfire. 1x Central Yharnam, behind some boxes near the plaza, on the left hand side when passing under the Great Bridge. 1x Central Yharnam, on the Great Bridge at the opposite end of Cleric Beast, hidden behind a statue. 1x Central Yharnam, on a ledge reached by stairs down from the Great Bridge, behind some sandbags at the far end. 1x Central Yharnam, on a ledge reached by stairs down from the Great Bridge, behind some boxes which also blocks a hidden sewer entrance. 1x Central Yharnam, on a corpse right before the shortcut gate back to the Central Yharnam Lamp. 1x Central Yharnam, in the way to the sewers, if you drop onto a beam instead of taking the ladder down. 1x Central Yharnam, in the watery level of the sewers, in a corner next to an ambushing corpse. 2x Central Yharnam, sewers entrance, in one of the rat holes on the ledge above the boats. First cut down the hanging corpse up at the top by exiting through the window before the sewers entrance. 2x Cathedral Ward, next to a big gate right before the first Reaper enemy. 3x Cathedral Ward, going down the stairs from the Reaper, approaching the ball and chain Reaper, behind a crow. 5x Cathedral Ward, in front of the ball and chain Reaper. 3x Cathedral Ward, drops from Scurrying Beast behind the ball and chain Reaper. 3x Old Yharnam, dropped by a Scurrying Beast straight ahead of the entrance. 1x Old Yharnam, on a ledge straight ahead of the entrance, where the Scurrying Beast drops down. 2x Old Yharnam, around the back of the building across the first bridge. 1x Old Yharnam, in a side room in the building where Djura starts shooting at you. 2x Old Yharnam, behind some crows before entering the second building. 2x Old Yharnam, on a balcony inside the large building with the beast hanging from the ceiling. 2x Old Yharnam, on a balcony overlooking the boss area, surrounded by crows. ?x Old Yharnam, drops from a Scurrying Beast in a corner of the foggy area with pillars before reaching the streets below. 2x Old Yharnam, in the streets below, next to the Darkbeast Paarl door. 2x Old Yharnam, on a side entrance in the spiral staircase shortcut connecting the upper and lower parts. ?x Old Yharnam, drops from a Scurrying Beast on a staircase leading down to the Church of Good Chalice. x36? Nightmare Frontier, drops from Scurrying Beasts throughout the area. See Scurrying Beast page for locations. I don&apos;t believe that killing the blood starved beast is what triggers these appearing in the insight shop. It says that they have appeared before killing the blood starved beast, and also I (and apparently others) have not had them show up even after killing the blood starved beast. I already have the radiant sword hunter badge, so that isn&apos;t the trigger for these appearing in the insight shop either. Notice that the image shows what looks like DNA in the middle of the shard. DNA of a Great One, perhaps? Similar to the Titanite from Dark Souls being from slabs created by the blacksmith god? I killed the blood starved beast as my third boss, now I&apos;ve progressed past 4 more and noticed the shards aren&apos;t available in the shop? Is this a bug? Is there another requirement? Its fast to farm Blood Stone Shards in the lower part of Old Yharnam right before where you reach the Blood Born Beast boss location in the Church of the Good Chalice. There are five werewolves all in row here and they drop a Bloodstone Shard almost every time (and the rare beast pellet). Its really fast to farm if you wait till you kill the Blood Born Beast so you can spawn at the Church of the Good Chalice torch. Spawn here and head backwards into old yharnam, killing the five werewolves. You will get 1000 blood echoes for each one (5k total) and probably get five blood shards total. Run back to the church torch to reset the level (or teleport with Bold Hunters Mark if your lazy) and rinse and repeat. Get to the Hypogean Gaol, near the lamp up top on the circular stairs, there are two snatchers and two others guarding the way to Paarl, these four have what seems to be, a guaranteed drop of 2 shards, and a chance at a Twin stone instead.